Caroline Cooper - Bayfield Stud - Dunsfold. I have used Curling Contractors for several projects at our private dressage training facility and stud. 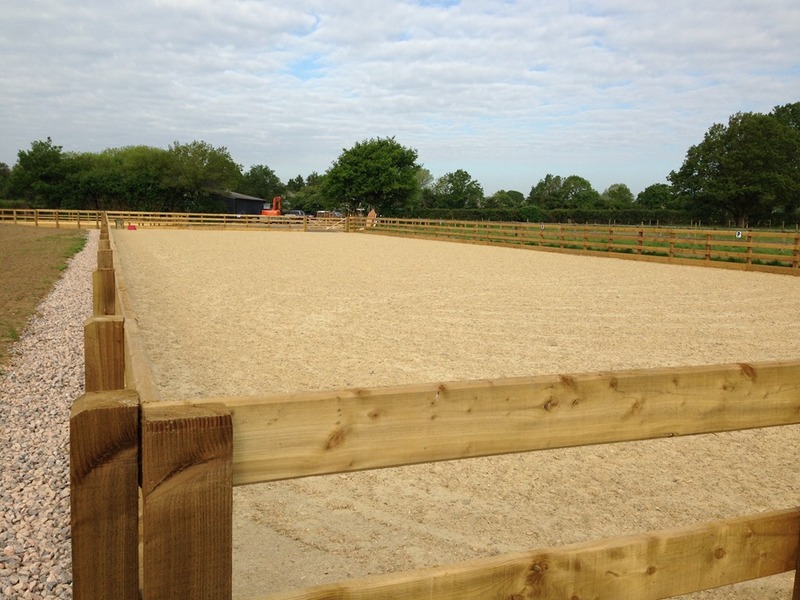 Jeremy has installed a new 20 x 60 arena with wax surface, a horse walker, all weather turn out pen, fenced several paddocks, dug ditches, piped water troughs, re landscaped and laid hard standing. I would have no hesitation in either recommending Curling Contractors or using them again. Their work is of an extremely high standard and they are a pleasure to have around. They are hard working and courteous and Jeremy is a perfectionist so I had no worries about just 'letting them get on with it', coupled with the fact that Jeremy dealt with everything, including our extremely difficult access, making the whole project relatively stress free for me. Everyone who comes to the farm has admired his work, especially the chamfered rails on my arena and the horse walker has been described as a thing of beauty! Jeremy's work has no doubt increased the value of our property and has made it a far easier environment to work the horses in. As we have high value horses here, the standard of workmanship was of utmost importance to me and Jeremy has far surpassed all expectations. "When my family and I moved to our new home on several acres our immediate concern was the fencing ... our family includes a rogue beagle, a placid but sturdy Rottweiler, a huge German Shepherd Dog and the boss a super intelligent border collie. We have been here several months now and the beagle, otherwise known as Houdini, has been unable to find an escape route which is a testament to the excellent work of Jeremy Curling and his team. 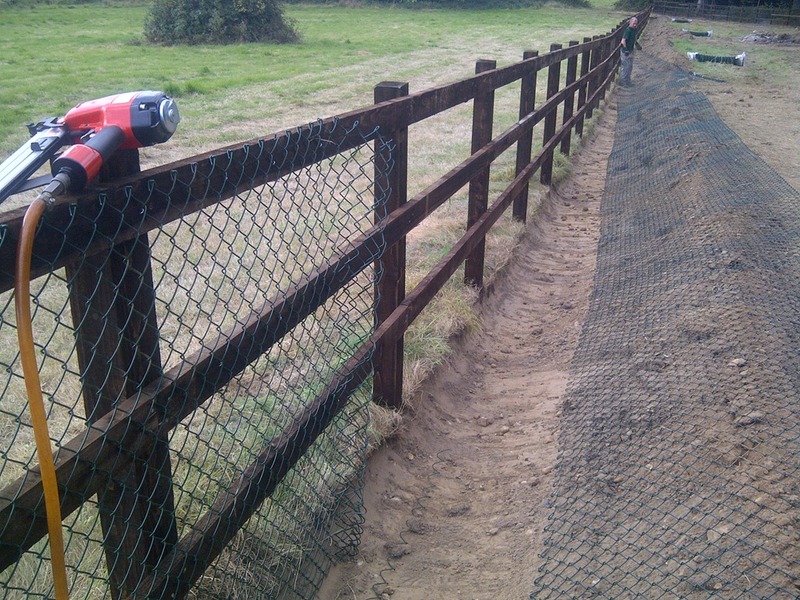 We are delighted with the outcome and can thoroughly recommend him for all fencing needs''. "Jeremy Curling has worked for Garson Farm since 1991, erecting fruit trellis, rabbit, deer and horse fencing. His service has always been courteous, efficient and punctual. He provides value with a sense of humour and pride, he will never leave a job unless it has been "done right". Bob Thompson is one of J. Curling's longest standing customers and runs a very successful pick your own and garden centre operation in Esher, Surrey. http://www.garsons.co.uk Garson Farm is a FARMA award winner " Best PYO Farm 2007"
"Jeremy & his team were successful in winning the tender to restore Knepp Castle's parkland in 2001. The project included miles of fence removal, 20 miles of deer fencing, iron railing, oak palisade fencing and bridge building. The work was completed to such a high standard that when subsequent phases were implemented the estate did not seek further tenders but engaged Jeremy again. Land agent Jason Emrich said it was a pleasure to work with Jeremy; despite horrendous weather he remained consummately professional." "Jeremy and his team were the first contractors on site when we bought Chilworth Manor and began the total renovation of both the house and grounds. Jeremy carried out many thousands of metres of post and rail, estate railing and other types of fencing and throughout remained positive, professional and cheerful. I have no hesitation in recommending Jeremy and his team to anyone wishing to carry out any large scale projects"
If you have a project in mind, don't hesitate to contact us. We will be happy to discuss your exact needs, give advice as appropriate and develop a detailed specification and price.